Founded over a century ago, Johnson Machine Works has earned a worldwide reputation as a trusted provider of fabricated steel. Located in the southern Iowa city of Chariton, JMW began as a repair shop for local farmers and builders. Through the years, JMW branched out to include not only structural steel fabrication for commercial building, but a variety of products and machines for the sewage treatment industry and the fabrication of locks, dams and gates for hydro-electric power plants and transition waterways across the world. Established on the cornerstones of competitiveness, trust, quality and efficiency, Johnson Machine Works is never content to do the minimum and takes a proactive role in assuring that your steel fabrication project is built correctly with a tireless focus on quality of workmanship no matter how large or complex your steel fabrication needs are. 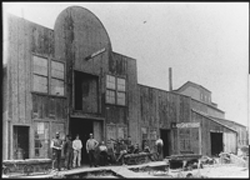 We invite you to explore our interactive timeline for more information on the history of Johnson Machine Works.